When volunteers from Bancroft’s Hospice North Hastings covered a bridge with thousands of hand-crafted poppies last year, they inspired dialogue and the sharing of memories. Now, one year later, the poppies are making a comeback — but with a stronger, more direct message. The volunteers who crafted the poppies last year spent hours thinking about peace and remembering those who had made the ultimate sacrifice while they made each flower. This year the focus was a bit different: it was still about peace and an important anniversary, but it was also about coming together as a community and providing caring and comfort, no matter what. 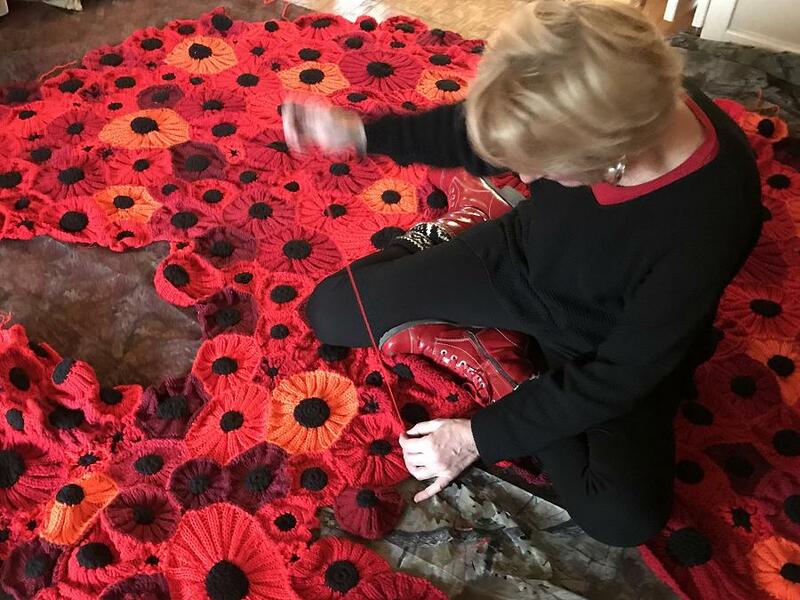 So, with this in mind, the women started pulling the big bags of poppies out of storage and they started to stitch all of the poppies together into one huge flower. 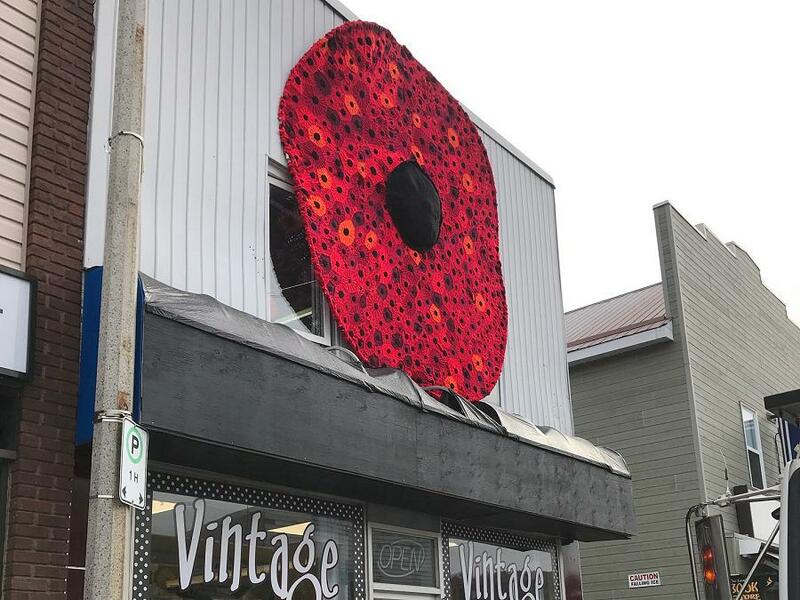 At more than 11 feet tall, it is the largest hand-crafted poppy in Canada, and is now hanging on the front of Vintage on Hastings (the store operated by Hospice North Hastings) until Remembrance Day to celebrate the 100th anniversary of the armistice that ended fighting in World War I between the Allies and Germany. The poppy, made famous as a symbol of remembrance in the 1915 poem by Lieutenant-Colonel John McCrae, has been embraced by people worldwide as they remember the fallen. One hundred years ago, on November 11, 1918, with the German resistance on its last legs, the armistice was signed. Canadian soldiers fought to the very end and, with this special anniversary, comes a renewed reflection on the fragile peace that has come and gone ever since. Every remembrance about the war and every hope for peace is unique, just like the thousands of hand-crafted poppies made by the Hospice volunteers, but the message of their installation is clear — bring together these remembrances and the recognition of the great sacrifices made and create a fabric of hope for peace, comfort, and care. 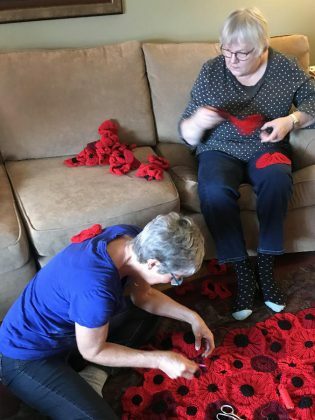 Gathering at the Hospice House last Saturday (October 27), volunteers ate pizza, drank wine, and sewed poppies to the backing. With the light growing dim, the women talked about life, their work with Hospice, memories of service men and women they have known and, through all the conversations, there was a feeling of responsibility — a need to make life better for others, because to these women, that’s a responsibility that comes with freedom. The conversation moves to housing insecurity, politics, human nature, and then returns to memories of those who served. 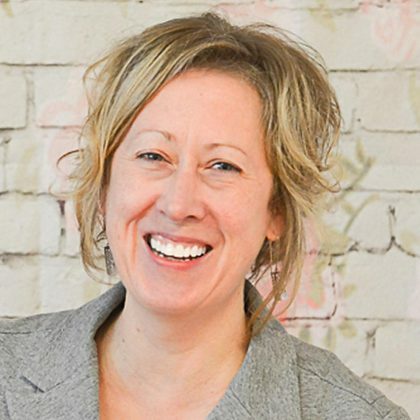 Helen Vermeersch grew up in a military family and her children now serve. She helped with the poppy project last year and at her son’s summer wedding, some of the poppies were on display with a book of remembrance — recognition that even in times of great joy, the sacrifices made should never be forgotten. 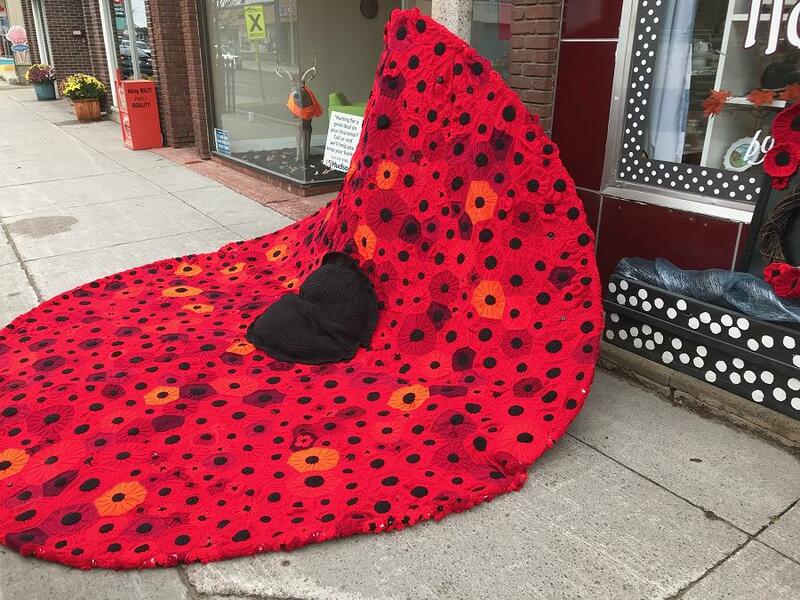 Helen’s honoured that her children will be in Bancroft for Remembrance Day and that they will get to see this latest installation. Yvonne Heath, another member of the volunteer team, was tasked with actually mounting the 11-foot poppy on the front of Hospice’s storefront in downtown Bancroft, with the Town of Bancroft sending some of its public works crew to assist with the task. “I used to play with Meccano so I’m working on a plan,” she says. Yvonne sees the huge poppy as a symbol of peace, hope, and caring and she loves the idea of hanging it in front of the Hospice storefront to let people know, symbolically, that she and the other volunteers remember and are willing to face challenges to make the community a better place. “We want to bring this home so now everyone will know how to get to us,” Yvonne says quietly. Peace means different things to different people and for this group of women who spend their time volunteering in different capacities for Hospice, their commitment is clear: they will step up, they will care, and they will share what resources they have to provide comfort to those in need. And while they have not had to face the horrors of a battlefield, they honour and remember those who have with every stitch of this heartfelt local project. 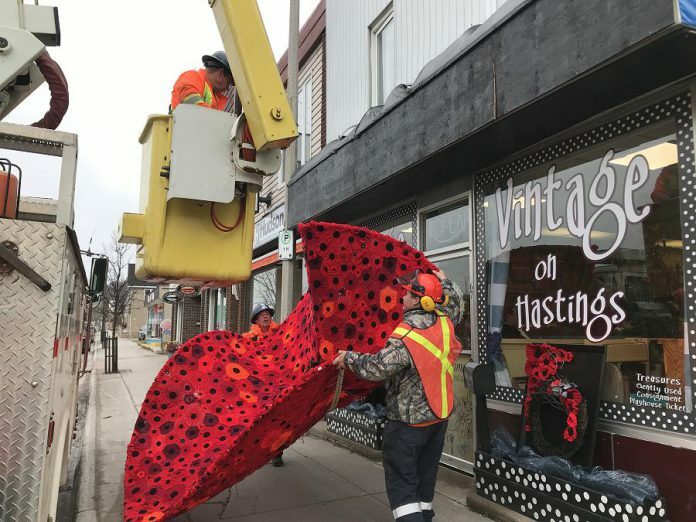 The huge poppy, crafted from thousands of smaller poppies, will be on display on the front of Hospice’s store, Vintage on Hastings, at 67 Hastings Street North in Bancroft, until Sunday November 11th. 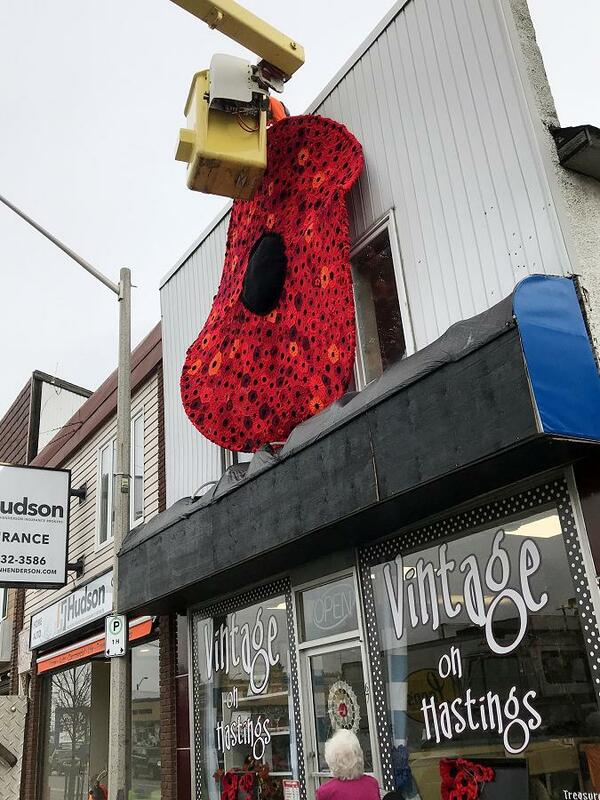 Vintage on Hastings will open on Remembrance Day and the poppy and some vintage displays will be on show for all who want to drop by to share memories.